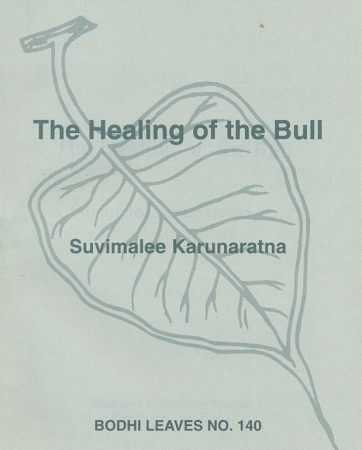 Healing the Bull is part of the Bodhi Leaves series, published by the Buddhist Publication Society in Sri Lanka. These are very small booklets on a wide range of topics. Healing the Bull is a short story of an abused bull, who tells his story to a wise elephant and gets advice on the nature of his problems, and the way out of them from a turtle. The story is about letting go of hatred and aversion and the clinging to security, which allows one to be peaceful. From the story: "One day, into the temple premises where Kapuri the she-elephant, the wise tortoise, and the peacock lived, there arrived a work-worn bull. Kapuri saw him seated in the middle of the temple grounds behind the monks' quarters, looking as though he were weighed down by a world of sorrow. When Kapuri's mahout tied her to the accustomed jak tree after her day's work and went away leaving a heap of kitul palms for her to munch on, Kapuri cast several thoughtful glances in the direction of the bull. He was seated close by, looking like a dejected sack of bones that had been carelessly deposited on the ground. "Friend, from what part of the country have you come? Are you staying here long?" Kapuri asked him..."
Sometimes it is helpful to take a break from an analytical Dhamma book and pick up one that frames the same principles within a simple fable like The Healing of the Bull. This shouldn't be labeled as just a children's book, but it did make me feel comforted like I was by a good story as a child. I was also impressed by the sophisticated quality of dialogue and the author's ability to weave in the teachings of the Buddha. I was intrigued to research the author and on dhammawiki.com they do have some information that I will cut and paste here: Suvimalee Karunaratna was born in Sri Lanka in 1939 and received her early education in Washington, D.C. and in Colombo. While living in Rangoon, where her father was posted as the Sri Lankan ambassador to Burma from 1957-61, she received meditation instructions from the Ven. Mahasi Sayadaw and the Ven. Webu Sayadaw. Her first volume of short stories was published in 1973, and several of her short stories have appeared in anthologies of modern writing from Sri Lanka as well as in literary journals. 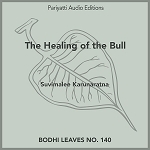 She is the author of several titles in the BPS's Bodhi Leaves series of booklets, including The Healing of the Bull, Prisoners of Karma, and The Walking Meditation.